During your next shopping trip in Vegas, stop by and see the gorgeous garden at The Shoppes at The Palazzo. When I first saw this enchanting, brilliantly-colored display, I felt I was in the middle of a fairy tale. Perhaps it’s the swirling, hand-sculpted 80-foot vine with copper leaves and hand-painted pumpkin blossoms. Or maybe it’s the 8-foot shimmering copper leaf hanging from above or the clusters of gigantic pumpkins below. 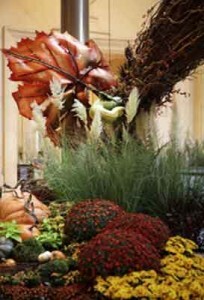 Located right beside the mall’s indoor waterfall fixture, the garden bursts with autumn delight. In addition to the amazing fixtures and all the pumpkins (some weighing as much as 1,000 pounds), the garden also features trees surrounded by a variety of yellow-orange flowers, mums and cattails. Come see the autumn display before it’s gone through Nov. 29, 2009. Make sure to take lots of pictures so you can create a fairy tale book of your own.